First, a bit of background information. The Coalition is "a worldwide network of 'sites of conscience' -- historic sites specifically dedicated to remembering past struggles for justice and addressing their contemporary legacies." The Coalition started in 1999 with nine founding members (such as the Tenement Museum in New York City, the District Six Museum in South Africa, the Liberation War Museum in Bangladesh, and others), and now includes 17 accredited sites, and nearly 250 members. These museums, parks, memorials and other sites use their own legacies of injustice to support human rights and justice struggles today. 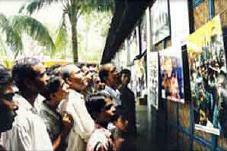 For example, the Liberation War Museum in Bangladesh memorializes the 1971 murder of as many as 3 million Bengali people by Pakistani government forces, and the subsequent creation of a democratic government. Among other programs, the museum sponsors a "Mobile Museum," and engages young people to collect eye-witness accounts of the events of 1971, which it then deposits in its archives. In so doing, the Museum prompts a critical dialogue on genocide and state power -- and cleverly involves young people in the expansion of the historical record. One of two sites in South Africa, Constitution Hill is the location of a the notorious Old Fort Prison, better known simply as "Number Four," which held many now-famous South Africans, including Nelson Mandela. 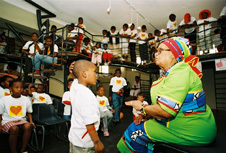 The photo at right (credit: Oscar G., from the ICSC website) depicts a former prisoner speaking with a visiting school group. In a powerful re-imagining of the place, it is now used as a Constitutional Court, as well as an educational center on the country's politically repressive past. The site offers so-called lekgotla -- public, non-hierarchical dialogues to decide on matters of social importance -- on citizens' constitutional rights and responsibilities. To my mind, it's remarkable for being such a strong program in so relatively new a democracy. The governments in both these sites would seem to benefit from the historical interpretation provided at these museums. Both countries decry the (genuinely) bad old days, and tout their current freedoms. However, in some other sites, the relationship might be a bit more uncomfortable. 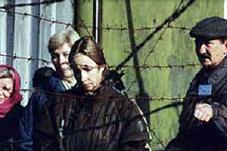 Take the Gulag Museum in Russia, the site of a notorious Stalin-era labor camp called Perm 36, which was later turned into a prison that held political dissidents of the Soviet regime, right up through 1987. In a country where Prime Minister Vladimir Putin continues to take action against free assembly and a free press, the Gulag Museum may serve as an embarrassing display of the similarities between the old and new regimes. Or perhaps the museum relegates the terror of the Gulag labor camp system entirely to the past, thus presenting no challenge to present-day Russia or its government. Or maybe it successfully challenges visitors to make such connections for themselves. I'm not sure. Alas, barring a sudden windfall of cash, for now I can only visit the museum's website, rather than the museum itself. A recent story by Kate Taylor in the New York Times presents questions that are relevant to any history museum that deals with social injustice. Taylor writes that the staff of the National Museum of African American History and Culture, set to open in 2015 on the National Mall, is "grappling with fundamental questions about the museum's soul and message. Among the biggest, of course, is: What story will it tell? As part of the Smithsonian, the museum bears the burden of being the “official” — that is, the government’s — version of black history, but it will also carry the hopes and aspirations of African-Americans. ... Will the story end with the country’s having overcome its shameful history and approaching a state of racial harmony and equality? Or will the museum argue that the legacy of racism is still dominant — and, if so, how will it make that case?" That last question especially -- how the story ends, and what it points to in today's society -- is a critical one for all museums, especially these "Sites of Conscience" that have as part of their very mission to address the legacy of injustices in their countries. (The National Museum of African American History and Culture is not a "Site of Conscience," at least not yet.) These museums and memorials would seem to be most necessary -- and least tolerated -- in countries with repressive governments. But even in the freest of countries, the question still stands: how does the story we're telling relate to the official story? love Gettysburg Museum....A definite stop on your tour of Gettysburg. Look for costumed reenactors on the streets and don't be afraid to stop and chat with them. Awesome Attraction for all the people…..